My name is J.D. Hartnagle and I am the Principal of JDH Design. From an early age, I’ve been interested in how things are made and how they work. This passion eventually led me to the field of Industrial Automation, where I have spent my entire career designing and building custom automation machinery around the world for industries including Manufacturing, Oil and Gas, Food, Automotive and E-Commerce. I have seen first hand what it takes for automation to function properly in a manufacturing setting. It involves taking a holistic view of the project taking many factors into account from the first site visit to the final screw. JDH Design is built around the priniciples which I have seen succeed in manufacturing environments. 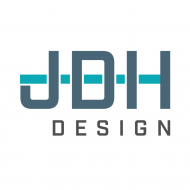 JDH Design strives to provide a great customer experience every step of the way while providing knowledgeable, practical and reliable solutions on time, every time using sound engineering decisions to serve your manufacturing business. I look forward to our next challenge! JDH Design, Blog at WordPress.com.